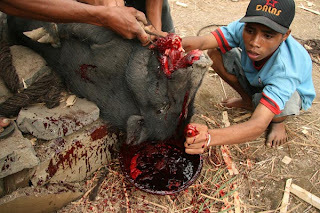 2 August 2011, Dili, Timor-Leste – Long running violence in a district just outside Timor-Leste’s capital ended last week with a dance, a prayer, a speech, and the sacrifice of a goat and a pig. For years, rival youth groups in two communities in the hilly sub-district of Metinaro, fought fiercely over land issues. Nothing could put an end to their aggression, until now. A ceremony, known locally as a Tara Bandu, brought villagers together to make a communal promise. In this case, nearly three dozen members of three rival martial arts groups and elder representatives from two villages signed a document pledging them to respect the environment, cease using violence to solve their disputes, stop occupying others’ land, and end hunting in protected areas. More than 500 villagers came to witness this traditional ritual that ended in an animal sacrifice to seal the deal. “We talk about democracy, but we forgot how to respect each other,” said Adão de Araújo, the Administrator of Metinaro sub-district. “We have now found a way to love our community and stop violence,” he said. This celebration of peace marked the culmination of a three-month “community dialogue mediation” that combined formal negotiation techniques with informal and traditional methods of resolving disputes. The United Nations Development Programme (UNDP) has been working with the Timorese government to strengthen its ability to keep these kinds of local disputes from turning into larger conflicts. A $3 million UNDP programme provided technical and financial assistance to create the Department of Peace-Building and Social Cohesion within the Ministry of Social Solidarity, and train national mediators in the districts of Ermera, Dili and Baucau in conflict resolution skills. This new government Department intervenes in local disputes when they turn particularly violent, and villagers are unable to reach agreements on their own. Training is also offered for community leaders, council members and traditional leaders in such techniques as facilitation of dialogues, and mediation. Some of these newly trained mediators helped resolve the dispute in Metinaro. Sources of conflict remain in Timor-Leste’s communities, sometimes as residual resentment from a 2006 national crisis that stemmed from grievances within the police and military. A two-year spate of violence resulted in more than 150,000 internally displaced persons who fled from their homes and took up residence in 65 camps scattered throughout Dili and the districts. As they moved back to their communities by the end of 2009, antipathy developed against the returnees, as did disputes over land and property, rivalries among martial arts groups, political and regional divisions, and restlessness among a large number of unemployed. Recognizing that building peace and social cohesion takes time, the Ministry of Social Solidarity decided to establish the Department of Peace-Building and Social Cohesion that finally came to fruition in December 2010, with UNDP support. Today’s ceremony in Metinaro marks the third local conflict that reached a resolution through assistance from the new Department. As Timor-Leste prepares for the 2012 national elections and the drawdown of the UN peace-keeping mission, sustaining the peace is all the more important in this 10-year-old country.